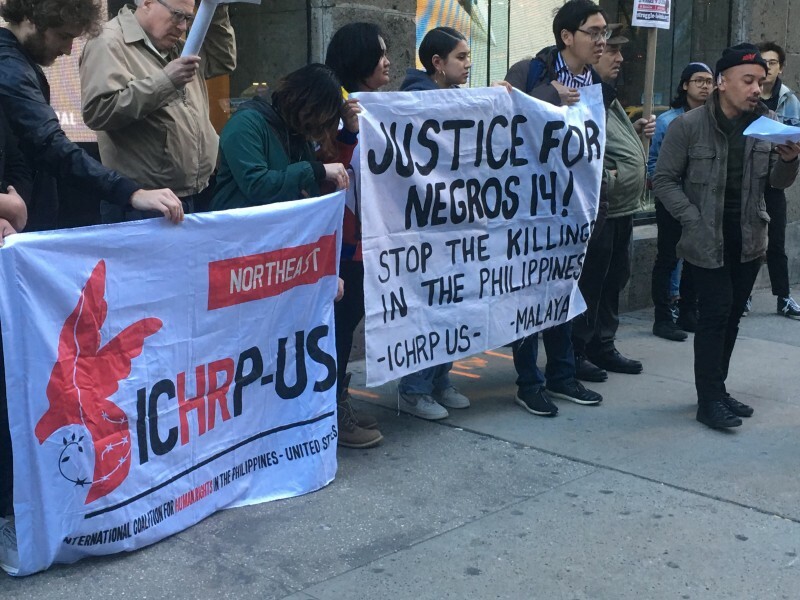 NYC rallies for the Negros 14, farmers killed by Duterte regime | Fight Back! 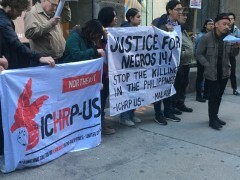 New York, NY - Forty people gathered in front of the Consulate General of the Philippines, April 10, in New York City to demand justice for the Negros 14, and to stop the killings in the Philippines, as part of a global day of action. The Negros 14 were a group of farmers murdered on March 30, with 12 others being illegally arrested. These murders are part of a continuous campaign by the Duterte government to target peasants and workers in the country. The action was organized by the International Coalition for Human Rights in the Philippines Northeast and the Malaya Movement Northeast. The crowd chanted and heard speeches from affiliated and allied organizations. The speakers emphasized that despite the violence, the people of the Philippines and those who stand with them will keep speaking out and fighting back. “People cannot speak out against injustice if they are being murdered, or so Duterte would hope. But no matter how much violence he enacts against the Filipino people, those who fight for justice will not stop until it is won!” said Jessica Schwartz from the Committee to Stop FBI Repression. The rally ended with a vigil, moment of silence, and a cultural performance, highlighting the Duterte government’s crimes and the need to keep fighting back.